KEZY went on the air on 1190 in 1959 (first with only 1,000 watts), with studios at the Disneyland Hotel. It was first known as K-EZY, or K-easy, likely due to an easy listening music type of format. People could see the small studio as they entered the front of the Disneyland Hotel on West Street. Cliff Gill was the station's first president and general manager. 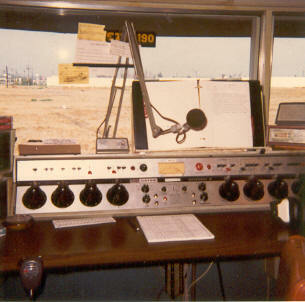 Around 1966, the great Ted Quillin, formerly with KFWB and KRLA in the late-'50s and early-'60s, was heard on KEZY. Day power increased from 1,000 to 5,000 watts. Sometime around 1968-'69, KEZY moved to a larger complex for its studios and offices, located (coincidentally) at 1190 East Ball Road in Anaheim, near the intersection of Ball Road and East Street. It was around this time that KEZY turned to a top-40/pop/rock format, and became the station Orange County teens tuned to in the late-'60s and early-'70s. Arnie McClatchey was KEZY's program director from 1967 to 1974, and took the station from K-easy to "KEZY GREAT RADIO". Morning man Mark Denis became program director in 1975. Jim Meeker was another key DJ during this time. Steve Sands was another big name at the station, and would later do overnights at KROQ AM. "Mark helped me a lot with the programming, we would get in my office and brain storm to come up with our one liners and contests. We did not know it at the time but we were doing some the best radio ever." Arnie McClatchey became GM of KYMS-106.3 FM in Santa Ana in 1975, to make KYMS the first Contemporary Christian music station in the nation. KEZY-AM had a great sound with its jingles, music and personalities. The KEZY DJs were out there, making appearances around Orange County and many times we'd see them at high school assemblies and other local events. Emperor Bob Hudson, who had previously done mornings at KRLA in '63 and '64 (possibly part of '65), worked at KEZY, and later teamed up with Ron Landry as Hudson and Landry doing mornings at KGBS-1020 in the early-70s and making some great comedy albums such as Ajax Liquor Store. Later, the talent lineup included Bruce Chandler, Paul Freeman, Mike Wagner, and Dave Sebastian, among others. When Rick Carroll was hired at KEZY, most of the previous talent was dismissed and Carroll hired his own troops. The new line-up included Big John Carter (mornings), Mark Denis (a holdover from the pre- Carroll days, mid-mornings), Jon Peters (afternoons), Russ O'Hara (midafternoon drive), Beaver Stevens (a.k.a. Pat Evans) evenings), and T. Michael Jordan (late nights). Newsman Adam J. Demarais was another of the holdovers from the pre-Carroll days. Pat Evans left the station within a couple of months and was replaced by Jim O'Neal. "The lovely and talented" Gary Kelly was also part of the lineup. KEZY was an interesting experiment -- DJs were permitted to play an occasional album cut, all of the selections were album-length (i.e. not shortened "45" versions), and the station used an audio processor designed by engineering wiz Greg Ogonowski, making KEZY one of the best sounding AM stations on the air. But the best days of 1190 had passed them by. Unfortunately, FM was already dominating music radio in Southern California (in part, due to the earlier success of KKDJ), Rick Carroll had left the station due to personal problems, and the top 40 format folded. There was a short-lived attempt to make KEZY-AM an AOR station with KEZY-FM programming "mellow" music ("KEZY-FM kicks back, KEZY-AM kicks. . ."). The AM hired talent such as Shana and "Strawberry Jan" (better known as Jan Marie), but the station would never return to its earlier glory days. Eventually the KEZY call letters would be relegated to the FM dial, with the AM station attempting (unsuccessfully) to become an Orange County all- news station under the PDship of Dave Forman, first as Newscenter 12, then K-News (KNWZ) 1190. Barbara Whitesides (most recently at KFI) served as one of the anchors, but left the station referring to the operation as "the Amateurville Horror." Afternoon anchor Marshall DeForrest was perhaps better known as Boyd R. Britton - Boyd was, in fact, doing mornings at K-Hits with Charlie Tuna, while doing afternoons as DeForrest at K-News. The KNWZ call letters had become official on March 30, 1983. But due to low ratings, KNWZ went back to the KEZY calls on February 2, 1984, less than one year later! Music was heard again on 1190 for a while. The next change for 1190-AM came on April 2, 1985 when the call letters became KPZE...This time, the format was religious on the AM as K-Praise! This lasted nearly 4 years. But on February 13, 1989, calls changed to KORG, for K-Orange. *One of the reasons that KEZY had a "small but loyal" following was that the station could be heard in L.A. during the daytime with its 5,000-watt non-directional signal, but disappeared at sundown, going to a 1,000-watt directional pattern. The AM transmitter site was first in Placentia, but when more housing tracts were built nearby, it was moved in the mid-70s to Santa Ana Canyon, near La Palma Avenue and Lakeview. Around 1984, the daytime power was increased to 10,000 watts. Later still, the 1190 transmitter was moved to the hills north of Brea near the Orange-L.A. County line above the 57 freeway. I also recall that we used to be able to walk to the side of the KEZY building at 1190 E. Ball Rd and see the KEZY jocks on the air thru the window on the side of the building...I think that was long before that lumber yard was next door to the station and there was just open space to the east. Now they have 10,000 day and 1,300 w. at night, but there is a CP to go 20,000 watts day. The night pattern still appears about the same as it used to be. 1190 was first dominated by 50,000 watt KEX in Portland, Oregon, with another 50kw station on 1190, WOWO in Indiana. KEZY had to have that 1,000 watt directional pattern at night to protect the KEX skywave signal at night. I recall in the early-80s there was an ID on KEX that said "From Anchorage to Anaheim, this is 50,000 watt KEX, Portland"...and I heard a KEZY engineer wasn't too thrilled with that, since KEX was making it at night into KEZY's fringe areas!! I heard KEX and got a QSL card from them one night in the '70s, when KEZY was knocked off the air during a storm. I believe KEZY went to 5000 ( see additional comment ) watts in 1965. An engineer named Tom Settle from LA did the actual transmitter install. Tom later worked at KDAY in Santa Monica. The Placentia site was a four tower array... in line. When I went to work there it was in terrible condition and plans were made to relocate to near the 57 Freeway. By the way, KEZY was never 5000 watts until the third relocation. The station was short spaced with the Mexican border and as a clear channel facility had to limit the signal strength in that direction. The actual radiated power was 3900 watts daytime!! The Placentia site had a large power resistor in series with the tower to burn off 1100 watts as heat!!! At the second site (57 freeway), I left the resistor out and set the new Gates MW-5 transmitter for 3900 watts out. The second facility replicated exactly the night time array from Placentia... simply from a different location. The third relocation was done in an effort to increase nighttime coverage as well as daytime power to 10 kilowatts. By moving the array into the canyon, the position of the nighttime protection null to KEX was optimally positioned allowing the station to run with 1300 watts at night. For a very short while in 1977, the station claimed that someone had vandalized their transmitter site, so that the station "had no choice" but to broadcast without their directional pattern at night for a short while. While KEZY was broadcasting without a directional antenna, they were getting calls from East L.A., the westside, and places that the signal had never been heard before! People apparently did notice the difference, too bad they couldn't keep it that way. The station did apply to go 2,500 watts at night, but I'm not sure it was ever approved. In March 1999, KEZY FM switched over to "Mix 95.9", soon afterward changing call letters to KXMX. It largely broadcasts foreign language and other bartered programming. Greg Ogonowski is now the Director of Engineering at K-BIG after selling his processor company to Bob Orban, famous for the "Optimod" audio processor. Cliff Gill, who was also the station's original owner, passed away on September 8, 1999 in Vista, Cal. For the past ten years he owned KATY in Hemet, named after his wife.